Days after its tyre strategy was seen as one of the factors in its humiliating defeat by Mercedes in Singapore, Ferrari has opted for a similar strategy for the Russian Grand Prix. Though the choices were made upwards of three months ago, based on last weekend's evidence, Ferrari's strategy will hardly fill Sebastian Vettel with confidence as he seeks to close a 40-point deficit to Lewis Hamilton. While the Renault pair take the most hypersofts - each opting for ten sets - Ferrari, along with Red Bull, Force India, Haas, Sauber and Stoffel Vandoorne, has opted for nine sets. Mercedes, on the other hand, opts for the least, Hamilton and Valtteri Bottas taking just seven sets of the softest tyre in Pirelli's 2018 range. However, unlike Singapore, the Mercedes pair haven't swung entirely in favour of softs, instead opting for just two sets while taking four sets of the ultrasofts. 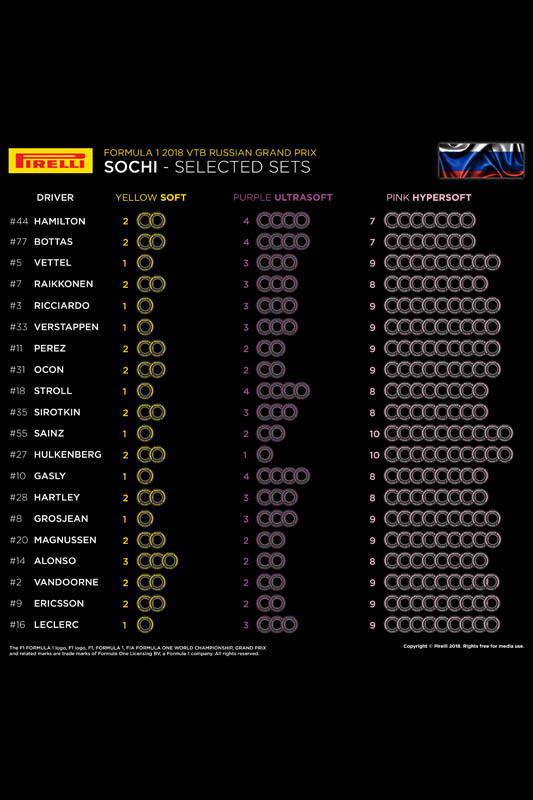 Vettel takes one set of the yellow-banded rubber to Sochi, as do the Bulls, Stroll, Sainz, Gasly, Grosjean and Leclerc. The Sochi track surface is smooth and as a result, with limited demands on tyres, degradation levels are among the lowest seen all season. Turns 2 and 13 are the heaviest braking zones, with the resultant risk of flat-spotting tyres, while the final sector is all about traction and braking, stop-go, similar to Abu Dhabi. The track is not used extensively outside of the Grand Prix, so it will be 'green' at first and while the most demanding corner is Turn 3, a multi-apex left-hander similar to Istanbul's Turn 8, the front-right tyre is worked hardest. For the last two years, the Sochi event has been held in Spring, while in the first two years it was held in October. Last year the compounds available were soft, supersoft and ultras, while in 2016 it was medium, softs and supers. Bottas won last year's race on a one-stop strategy, starting on the ultras before switching to supersofts. The same strategy was used by the first thirteen finishers, only Felipe Massa making an extra stop for a second set of ultras on his way to ninth.